Hearthstone (formerly known as Hearthstone: Heroes of Warcraft) is a free-to-play digital collectible card game from Blizzard Entertainment. 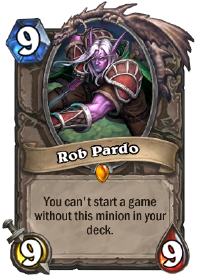 It was first announced in a presentation by Rob Pardo Rob Pardo Type: Minion Rarity: Legendary Cost: 9 Attack: 9 Health: 9 You can t start a game without this minion in your deck.See this card on Hearthpwn data page] Rob Pardo was Chief Creative Officer at the Penny Arcade Expo in March 2013, and began its closed beta The Hearthstone beta was the beta test phase in the development of Hearthstone, following the alpha test. 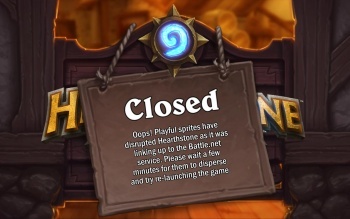 The beta test began in its closed phase in the Americas region on August 16th 2013, and in phase in the Americas region Hearthstone is divided into four geographical regions: Americas, Europe, Asia and China. Each country Hearthstone is available to play in is assigned to one of these regions. Each player by default uses their Battle.net account on August 26th, and in the Europe region on September 4th. 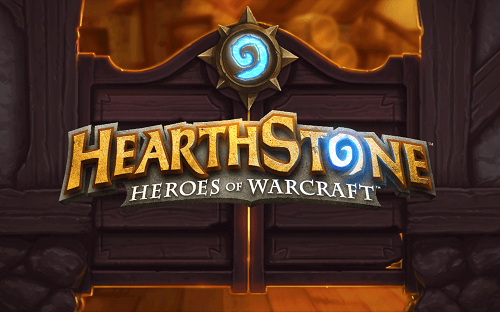 The game entered its open beta The Hearthstone beta was the beta test phase in the development of Hearthstone, following the alpha test. The beta test began in its closed phase in the Americas region on August 16th 2013, and in phase on January 21st 2014, and was fully released on March 11th 2014. Hearthstone is currently available on Mac OS X and Microsoft Windows operating systems, as well as on iOS and Android phones, Windows 8 devices, Android tablets, and iPad, supporting iPad Air, iPad 4th generation, iPad 3rd generation, iPad 2, iPad mini, and iPad mini with Retina display. In April 2016, it was announced that the game had surpassed 50 million registered players. Hearthstone is a free-to-play card game set in the Warcraft universe. Players can compete against other players or AI opponents in 1-on-1 combat, battling to destroy the enemy hero A hero is a character in the Warcraft universe representing the player. 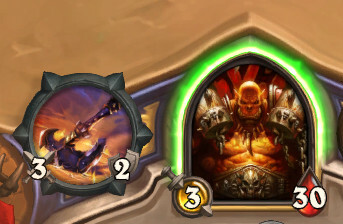 In Hearthstone, this concept is expressed in three interrelated but distinct ways: Heroes are gameplay characters representing players or bosses within a match. before they are themselves defeated. 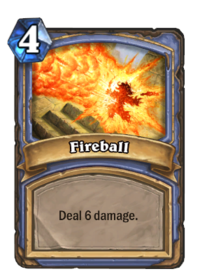 Players can achieve this using a variety of spells Fireball, a simple mage spell. It costs 4 mana, dealing 6 damage to a chosen target. 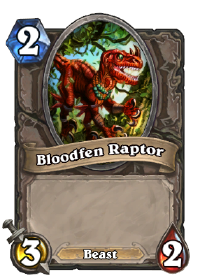 Spell cards are cards that can be played to trigger a one time effect or ability, described in the and minions Bloodfen Raptor, a simple minion card. A Beast-type minion, it has 3 Attack, 2 Health and a mana cost of 2. Minions are persistent creatures on the battlefield that will fight for their hero. Minion - creatures summoned onto the battlefield to fight on their behalf - as well as equipping weapons Garrosh Hellscream ready to attack using an equipped Fiery War Axe For the equip ability, see Equip Weapons are special cards which can be equipped by heroes. Each weapon has an Attack value and a to dive directly into the fray. 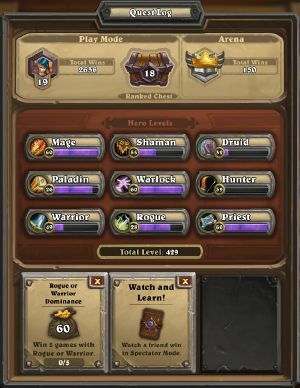 Hearthstone was designed to be a quick, fun and accessible game, but also offers significant depth, strategy and complexity for more serious players. 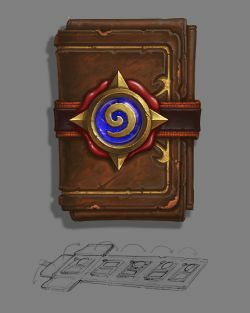 The game currently features 877 collectible cards Cards are the basic pieces that make up the game of Hearthstone. Each card represents an action that the player can take by playing that card. There are three main types of cards: spell cards, , and players can build and explore their card collections through an in-game collection browser. Players can gain new cards by purchasing booster packs Card pack concept art Card packs are items that players can open to acquire cards for filling a player s collection. 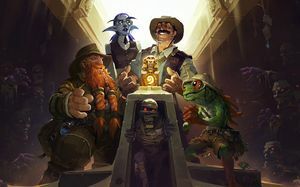 Only card packs for the current Standard format sets are available for purchase in the , using either real money or gold The gold counter, found in the bottom right corner of most menu screens Gold is a type of in-game currency that can be exchanged for card packs, or entry into either Arena or Heroic Tavern , an in-game currency earned from completing quests This article is about quests which reward gold. For the spell card, see Quest (ability). A quest in Hearthstone refers to a specific action or objective that the player can perform or achieve in order . The game`s cards, characters and locations draw from the deep history of the Warcraft universe, creating a game rich with detail and humour. Players can choose to play as any of nine different heroes A hero is a character in the Warcraft universe representing the player. 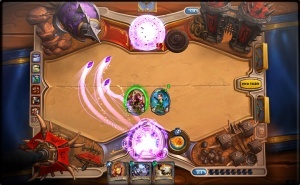 In Hearthstone, this concept is expressed in three interrelated but distinct ways: Heroes are gameplay characters representing players or bosses within a match. from the series` history, each representing a different class Class is the primary determinant of a hero s powers and abilities, and the strongest factor in deck selection. 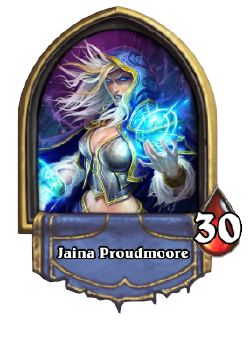 While each hero represents a unique character with their own personality, portrait and sounds, their class determines , complete with its own unique minions, spells and weapons, as well as a signature Hero Power Anduin Wrynn with the basic priest Hero Power Lesser Heal A Hero Power is a special ability displayed to the right of each hero s portrait. Usually Hero Powers can be used once per turn and all its own. Battle itself takes place on one of a number of battlefields The battlefield (or game board) is where the action takes place, representing the board on which each game is played out. Around the battlefield are various important UI elements, such as each player s hand, deck ; interactive game boards depicting well-known locations from Azeroth, complete with numerous hidden bonus features for players to find. 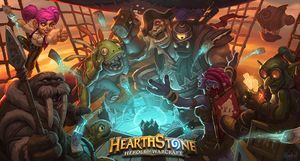 For an in-depth exploration of the game`s features, see Gameplay From the cut and thrust of glorious battle to the cunning construction of an indomitable deck, this page offers a rough guide to Hearthstone s gameplay. Use this as a helpful guide to getting started in . Hearthstone is playable cross-platform. 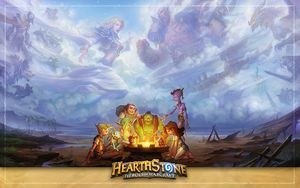 Players can play against any opponent in their region Hearthstone is divided into four geographical regions: Americas, Europe, Asia and China. Each country Hearthstone is available to play in is assigned to one of these regions. Each player by default uses their Battle.net account regardless of the device or platform used by each. Basic gameplay is identical on all platforms, although there are numerous differences to the interface to address the needs of mobile and touch-screen devices. Other cosmetic differences include the use of a different starting screen (see right). The only known difference in the game itself is one quest which is only available on mobile devices, offering a single card pack in reward for completing a game on that platform. 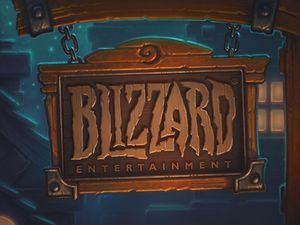 Differences between platform releases of the game have not been stated or commented upon by Blizzard. Another game of Hearthstone in progress. 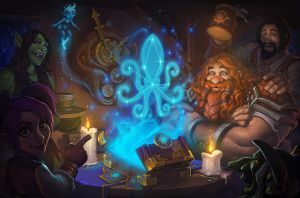 This article lists features which are currently in development for Hearthstone; are planned but are not yet in development; have been confirmed as possibilities for the future; and which have been specifically stated as not planned for the game. 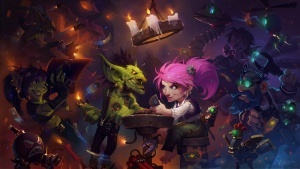 Hearthstone is set in the Warcraft universe, with the vast majority of characters, spells, weapons and locations drawn from World of Warcraft or earlier games. Wherever possible, the developers go to great trouble to recreate the feel and personality of cards` Warcraft counterparts. However, Hearthstone is not strictly tied to the lore of these games. In many cases Hearthstone has introduced new characters, spells and weapons, as well as reimagining existing ones. 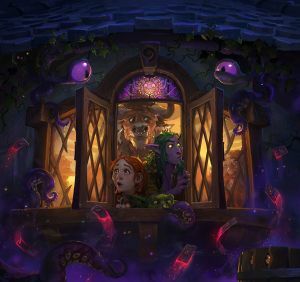 The game of Hearthstone itself also deviates from existing lore in several respects, and is steadily introducing new characters and events, which are not yet confirmed as existing in the main Warcraft universe. 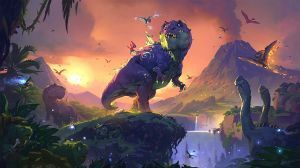 As the game continues to expand, an ever growing body of lore emerges that is clearly and uniquely Hearthstone. For background on specific cards and heroes, see Lore sections on individual pages. For an overview of new lore, see Hearthstone lore. For a list of cards original to Hearthstone, see Original cards in Hearthstone. 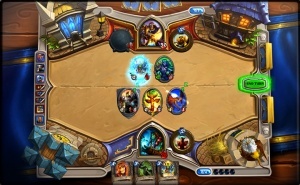 Hearthstone was developed by Team 5, originally a "small and nimble" group created specifically for the task. Team 5 handles all ongoing game design, with the assistance of the far larger roster of support team staff. 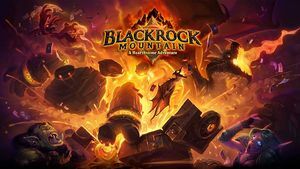 The team is headed up by Lead Designer Ben Brode and Game Director Eric Dodds. 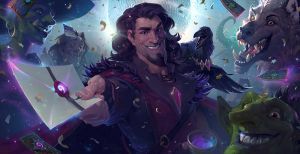 Community support for Hearthstone is provided by a small team of Community Managers, including Keganbe, Aratil, Daxxarri, Avarius, Molly, JesseHill and Community Team Leader Zeriyah. 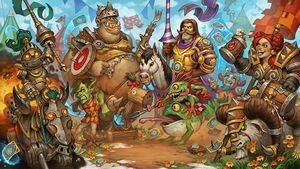 In the third quarter of 2016 Hearthstone achieved a record number of monthly active users, which had grown "a double-digit percentage" year-over-year. In April 2016, it was announced that the game had surpassed 50 million registered players. This update showed an acceleration in the game`s growth rate since November, with more than 10 million new players in less than 6 months. Following the release of Whispers of the Old Gods in late April 2016, the game hit new records for the number of daily active users and hours per daily active user. In November 2015, it was announced that the game had 40 million registered players. This marks a steady growth rate of roughly 5 million new players every 3 months, for the last year and a half. In May 2015, it was announced that the game had 30 million registered players. In February 2015, it was announced that the game had 25 million registered players. In September 2014, the official Hearthstone Twitter account announced that the game had 20 million players. In March 2014 it was announced that the game had 10 million registered player accounts. Players summoned a total of 5,829,905,234 Murlocs in 2016 (equal to nearly 80% of the human population of the earth at that time). 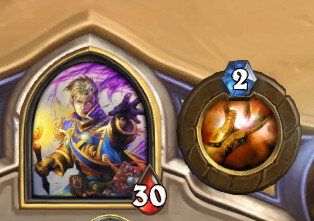 The most used Hero Power Anduin Wrynn with the basic priest Hero Power Lesser Heal A Hero Power is a special ability displayed to the right of each hero s portrait. Usually Hero Powers can be used once per turn and was the shaman`s Totemic Call, followed by the mage`s Fireblast, followed by the warrior`s Armor Up! Players drawing a Baron Geddon had a 56% chance to win. The more cards they drew, the more likely Control Warriors were statistically to win the game. 556 Defender of Argus were played for each Angry Chicken played. 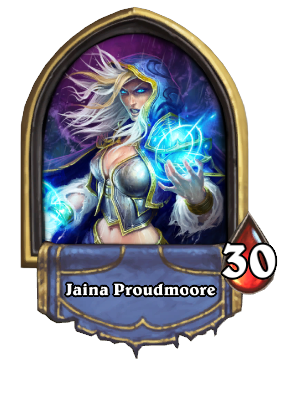 The deadliest Naxxramas boss in Normal mode was Grand Widow Faerlina, while the deadliest boss in Heroic mode was Maexxna. In a survey taken on Reddit in late 2014, the following words were used most frequently by players to describe what they liked and disliked in Hearthstone. Note that the latter list is far shorter, because players focused far more heavily on a few words in their `dislike` replies. See the images to the right for the full wordclouds. Hearthstone is played by many developers within Blizzard, on teams responsible for each of the company`s different franchises. An email from then StarCraft II Game Director Dustin Browder light-heartedly complained that his team were too busy playing Hearthstone to work on StarCraft. Blizzard`s first ever employee-only Hearthstone tournament was won by Luis Barriga, lead game designer for World of Warcraft. 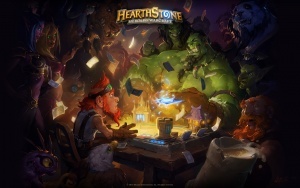 Hearthstone wallpapers, artwork and soundtracks can all be found in the media section of the official site. Class and Innkeeper Twitter icons and Facebook cover photos can be found here. Just a quick overview, link to main page. Minions are cards which fight to assist and deal damage to your opponents Hero, most cards come with Abilities of some sort. Spell cards are a one time use, and have some kind of effect or Ability. Spell cards expire immediately after use. Hearthstone has currently five different game modes. A draft mode called the Arena, constructed mode called the Play Mode, Challenge mode for battling with friends, Tavern Brawl that changes weekly, Practice mode for honing skills versus AI and Solo Adventures that includes single player challenges Curse of Naxxramas and Blackrock Mountain. Play Mode is a basic ladder format where players battle against each other with decks built from their own collection of cards. Often referred as constructed the Ranked Play mode is the main competitive element in Hearthstone. In the Play mode progress is represented by ranks from 25 to 1 and finally Legend ranks. Ladders are reset every month with the change of Season. Every three wins in the Play mode rewards players with 10 Gold up 100 Gold a day. Also a new Card Back is awarded to players who at the end of Season are ranked 20 or higher. Practice offers players a chance to battle it out versus AI using either pre-made Basic decks or with decks of their own creation. Recommended for players who have just picked up the game this mode is an easy way to familiarize with the game and earn some Hero Levels to complete their collection of Basic cards. Solo Adventures are short campaigns in which players battle their way through Hearthstone iterations of some iconic World of Warcraft scenarios. 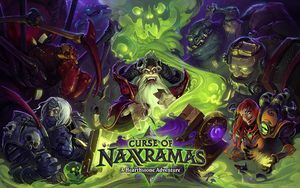 Currently two Solo Adventures Curse of Naxxramas and Blackrock Mountain have been released. Both Solo Adventures introduced a new Card Set that can only be obtained by defeating the Adventure. Arena, loosely based on the booster draft format found in many TCG/CCGs, is a game type that is entirely separate from constructed deck game modes and focuses on deck construction from random drafts. Arena is the only game mode currently that has a cost of entry, requiring either $1.99 or 150 gold from the player per run. A player may have only one Arena run active at a time, but there is no time limit in which to finish that particular run. In an Arena run, a player must first select one of three randomly selected heroes and then build an entirely new deck for the selected hero from a series of randomly selected cards. Players are shown three random cards at a time and must choose one of the three to be put in their deck. This selection process is done until a full deck (30/30) has been created. Though the cards are selected randomly, there is a uniformity of card rarity⃢₀ₔthat is to say, if one of the card choices in a group is legendary, all of the card choices will be legendary, and so on. Because of the random nature of Arena, basic deck limitation rules found in constructed are bypassed; therefore, a player can potentially have more than two of any particular card in their deck, and, though highly improbable, could also have more than one of the same legendary. Once the hero has been selected and the deck constructed, the player then can queue up for Arena matches against other players who have built decks in exactly the same fashion. An Arena run ends when either the player has lost a total of three games with that particular deck, or if the player has won a total of 9 times (without losing three) with that particular deck. 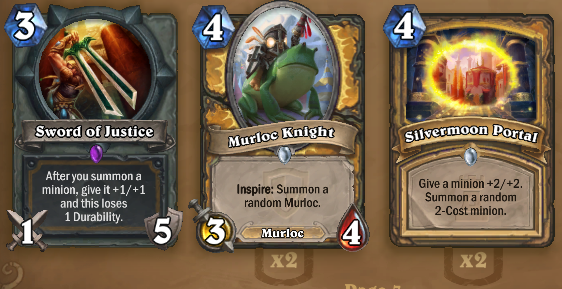 When an Arena run is finished, the player will receive a random series of rewards that vary based upon how many wins were acquired on that particular run. The rewards can include arcane dust, gold, rare single cards, as well as packs of expert Hearthstone cards; and the amounts of gold and arcane dust found in each reward will increase based upon win-rate. However, the rewards will always include at least one pack of expert Hearthstone cards regardless of win-rate. 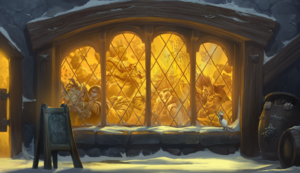 Tavern Brawl lets players experiment new kinds of decks and scenarios with weekly changing rulesets and game mechanics. Available for five days a week Tavern Brawl presents players with decks that for example consist of only Webspinners and some Class Spells. Even the casual observer would be able to note an influence from Magic: The Gathering, the grandfather of all collectible card games, so let`s take a look at some similarities and differences between Magic and Hearthstone. For the uninitiated Magic: The Gathering was the first collectible card game created in 1993 by Richard Garfield and introduced by Wizards of the Coast. In Hearthstone you have 30 cards in a deck, while in Magic you have to have at least 60 with no upper limit other than what you can reasonably shuffle. The difference is not as large as it first appears though. This is because of the mana differences discussed above. In Magic, you need to factor in the land cards you need to generate mana into the 60 card minimum deck size. Generally, you will use someplace between 21-24 land in a deck. This means that the deck sizes are really not that different, since they end up being roughly 36 cards for Magic and 30 cards for Hearthstone. Both Magic and Hearthstone utilize mana as a resource, however that is where the similarities between the resource systems end for the most part. In Hearthstone, players automatically gain one mana crystal per turn until the maximum of ten has been reached. The crystals refill between turns. In Magic players gain mana from tapping land. Mana is generated in 5 different colours as well as colourless. Players are required to ensure that they have enough land, of the appropriate colour, in their deck to ensure they draw enough land over their turns so that they can play their spells, making resource management in Magic a lot more complicated. An obvious difference between the two is that in Magic you select your deck by colour, and in Hearthstone you pick a class as your character. In Magic you have 5 colours of cards to choose from, each with their own specific flavour. There are also colourless artifacts cards and multi-coloured cards with 2 or more colours required to cast them. Any player can take any or all colours of cards, but are required to use the correct colour of mana to summon them, making it difficult to use more than 2 colours in a deck reliably. In Hearthstone, you choose between 9 classes that each has a set of cards with different effects that are available to only them. They each have a theme that defines that class. All classes also have access to a large pool of common cards that help round out your deck. 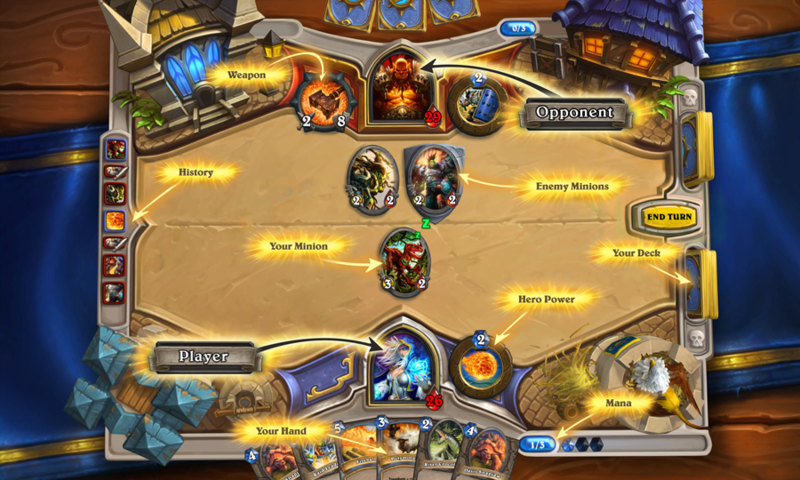 Hearthstone has just three card types - Weapons, Minions, and Spells. In Magic: the Gathering there are creatures (which minions are nearly direct copies of), sorceries (nearly identical to spells), lands, artefacts (which among other have subtype - equipment which is used differently than Hearthstone`s weapons), enchantments (which includes both auras played on other permanent types as well as global enchantments) and planeswalkers. Formerly there were also Mana Source and Interrupt type cards but these were eventually rebranded as Instants to simplify game mechanic. In Magic: the Gathering it is impossible to attack directly creatures controlled by opponent - player can only designate attacking creatures which - by default - attack only opponent. Then the defending players declares defending creatures, assigning 1 or more defender`s to any attackers he chooses to block. Also there is only one combat phase which resolves all combat in the same time (by default). In Hearthstone, however, the combat is always initiated by attacker against any target he chooses, unless there`s a creature with Taunt in play. Also it`s important to note that all damage in Hearthstone is permanent while in Magic: the Gathering all creatures are effectively healed by the end of each phase. This generally makes summoning non-combat utility creatures in Magic: the Gathering a lot safer while also making the Hearthstone more volatile and arguably more dynamic. Also the permanent damage would be probably harder to implement in tabletop card game, while in computer game it`s not an issue and something easier to grasp for a player familiar with video games in general. In Magic: the Gathering each player - to a degree - can affect what`s happening in opponent`s turn. Specifically speaking: Instant card types (and in old editions: also Interrupts and Mana Source cards) as well as permanent`s abilities can be activated as a reaction to player`s action or by the end of some phases of the turn. In Hearthstone the only way to influence what`s happening in opponent`s turn is to play Secret effects, that are - however - handled automatically by game engine. This difference leads to a lot more tactically complicated flow of the turn in Magic: the Gathering but makes the turn be more enjoyable for casual PvP online game. This also completely avoids the concept of stack of effects which could be confusing to new players. End of turn when all effects that happen at the end of the turn occur. Even without explaining what is happening in which phase/step, it`s clear that Magic: the Gathering is much more structured and requires more planning, as some effects can take place only in specific phase of a turn. It`s worth to note, however, that some phases in Magic: the Gathering make sense because the games is handled by people rather than computer. In Magic: the Gathering there are relatively few cards that rely on randomness, the only unrare exception being discarding card at random from hand. Hearthstone - on the other hand - have many cards which effects are more or less random, which leads to a lot less tactical game experience. Cards like Ragnaros the Firelord or Sylvanas Windrunner or even Shaman`s Totemic Call ability can - depending on the random effect - have dramatic influence on the flow of the game. There are also other influences, for example Legends of Norrath. What is the official story / lore of Hearthstone? A hero is a character in the Warcraft universe representing the player. In Hearthstone, this concept is expressed in three interrelated but distinct ways: Heroes are gameplay characters representing players or bosses within a match.